Stamping on parchment and heat embossing with different embossing powders can give a totally different look to the same stamp. 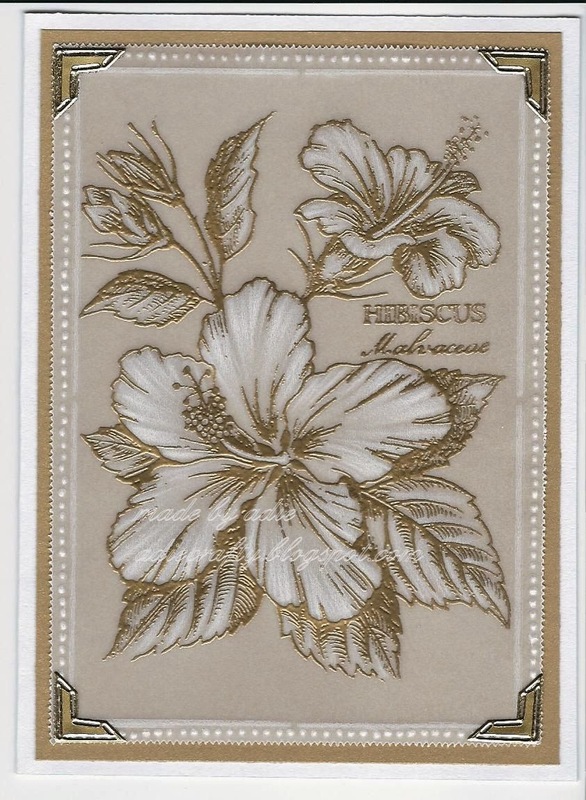 I have used one of my favourite stamps (discontinued) from PSX the Hibiscus. For this card I have decided to go gold and white. The image was stamped with Versamark and embossed with gold detail embossing powder. I then dry embossed the petals and leaves from the back to add some texture. I also embossed a simple border and attached the parchment paper to a metallic gold layer using gold corner peel offs and glue dots. Beautiful! Love the embossed look! Have a Blessed day! It's a stunner of a card Adrianne! Love the effect of the vellum with the beautiful metallic photo corners! Just gorgeous. Thanks for playing along with our "Power & Spark" challenge this month over at Power Poppy!